According to a new report by Transport for London (TfL) car levels in the city centre have plummeted while bike numbers have risen sharply, creating a pattern that could soon see the latter overtake the former during the peak hour. 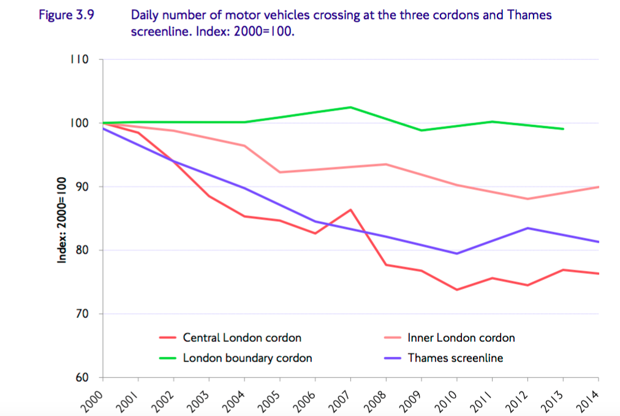 The number of peak-hour cars in Central London has more than halved since 2000, when an average of 137,000 drivers entered the Central London cordon every day. By 2014, that number had dropped to 64,000. The slump in Central London car numbers is substantially thanks to the city’s congestion charge, introduced in 2003, which saw vehicle numbers drop steadily in the years following. It must be stated that congestion charges is one of the main measures adopted to reduce the use of private cars in European cities. The rise in the number of cyclists, meanwhile, has been even more dramatic. While just 12,000 people cycled during the Central London peak hour in 2000, 36,000 were present in the same area at the same time by 2014. 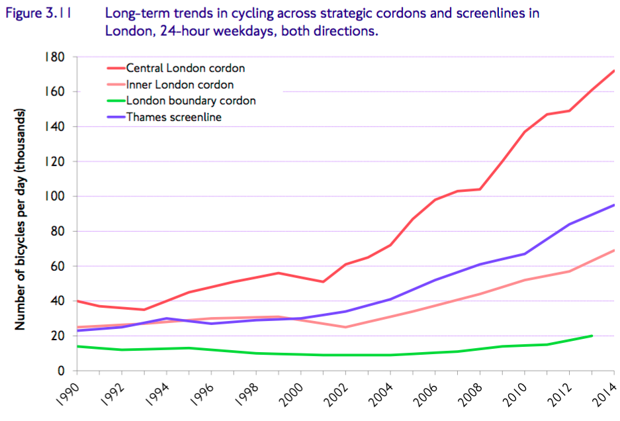 Across the day as a whole, the number of Central London cyclists rose from 40,000 in 1990 to almost 180,000 in 2014. London is reshaping the city to accommodate this demand. Cyclist futures are being brightened by a plan to construct properly protected lanes after years of making do with cycle lanes that were really normal, unprotected roads painted blue. The crown jewel among these is the East West Cycle Superhighway, a protected two-lane route shadowing the Thames River that should be ready this summer, although there are other Superhighways in due course. Elsewhere, London’s existing lanes are getting upgraded segregation, with special care being paid to classic blind spots, such as junctions. This cycling approach is widely replicated in many other cities and countries, where it can be highlighted the German efforts creating a national cycle network.